Germany - Herman Rarebell returns with a project that will surprise not only longtime Scorpions fans. 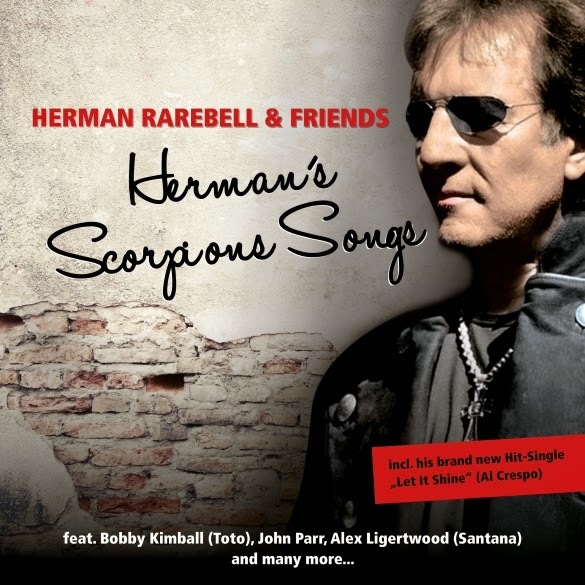 The former Scorpions drummer's long awaited new album 'Herman's Scorpions Songs' features some of the world’s best rock singers (Bobby Kimball, Tony Martin, Don Dokken, Doogie White and many more), doing their own versions of 13 worldwide Scorpions hits. All of them are all-time favorites that have been written or at least co-written by Herman. “Rock You Like A Hurricane”, “Dynamite”, “Make It Real” or “Animal Magnetism” – all in exciting new rock versions. With the brand new single “Let It Shine” Rarebell has added a wonderful new radio ballad to the 13 Scorpions diamonds. The song is sung by Al Crespo, lead singer of the German newcomer band “Unbreakable”. Herman regarding his collaboration with the young band: “If we want to hear good music ten years from now, we have to start now to develop and support new promising talents. It is a fact that bands like the Scorpions, Motörhead or Deep Purple will then be gone. Therefore I am happy to be able to give all my knowledge and experience to Al and his band. These guys have everything to become the new Scorpions”. Furthermore Herman sees the song “Let It Shine” as a legitimate follow-up single to “Wind Of Change”. 25 years ago, when the Berlin wall came down the world was set for peace and reconciliation; today things are going in the wrong direction again. We desperately need more light in this world, so “Let It Shine”! Thirteen classic Scorpions songs, in a new interpretation by Herman Rarebell and his friends, plus one brand new song – this album belongs into the collection of every Scorpions fan!.